Q: HOW ARE THE HEADBOARDS MADE? A: All of our headboards are individually crafted by our team using high grade materials and upholstery fabrics. Upholstery is a complex skill and we believe that mass machine produced furniture cannot achieve the same level of quality as a professionally hand made upholstered headboard,bed or ottoman. Q: WHAT IF I WANT SOMETHING DIFFERENT? A: We offer a bespoke design and upholstery service. Please contact us by telephone or submit an enquiry from the contact page. We are always excited about new and individual designs. We can offer your design in our fabric or a fabric of your choice. Q: DO YOU ACCEPT LARGER ORDERS? A: Yes. We have the capacity to produce headboards in larger quantities. Please contact us to discuss your requirements. Q: WHICH FABRICS ARE SUITABLE FOR CONTRACT USE? A: All of our fabrics are suitable for domestic use. We can have fabrics treated for contract use. If you are placing an order for contract use we are able to provide you with specific information upon request. A: We accept bank transfers and card payments (via paypal). Orders can be placed over the telephone or directly via our shop on the website. Q: ARE THE HEADBOARDS FIRE RETARDANT? A: Yes. All of our headboards meet the furniture and furnishings (fire) (safety) regulations 1988 and are labelled accordingly. Q: HOW LONG WILL IT TAKE FOR MY HEADBOARD TO ARRIVE? A: Usually three to four weeks, once payment has been received. 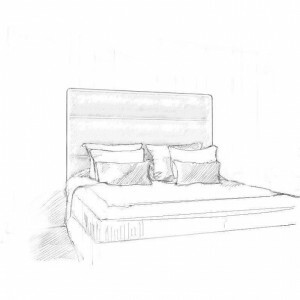 We will telephone you once your headboard is ready to arrange a time with you for delivery. Q: WILL I BE ABLE TO SEE THE FABRIC BEFORE I ORDER? A: We do recommend you order a free fabric swatch of your desired fabric and colour so that you are completely happy with how the final product will look and feel. Q: WHAT ARE THE WIDTH SIZES OF THE HEADBOARDS? Please ensure you measure your bed in case it is a non standard width. Other sizes can be made to order. Just telephone us or submit an enquiry from the contact page. Q: HOW ARE THE HEADBOARDS FIXED INTO PLACE? A: Either to the wall or with strutts that fix to your bed. When ordering please state which fixing you would prefer and they will be supplied with your headboard.